Prescott Granite Mountain Hot Shots. With shock and regret that we advise you that 19 Firefighters have died in the Line of Duty. Sunday night firefighters pushed the blaze back away from communities, hoping to keep the blaze from overtaking any homes.Interagency Hotshot Crews (IHC) are diverse teams of career and temporary agency employees who uphold a tradition of excellence and have solid reputations as multi-skilled professional firefighters. Crews are available for each fire season and are employed by the US Forest Service, Bureau of Land Management, National Park Service, various Native American tribes, and the states of Alaska and Utah. Their physical fitness standards, training requirements, operation procedures are consistent nationwide, as outlined in the Standards for Interagency Hotshot Crew Operations. 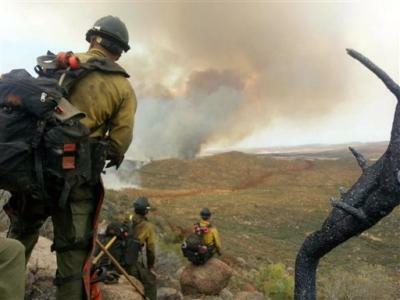 The Granite Mountain Hotshots are local government, not your typical federal hotshots. They are a unit made up of career firefighters and seasonal members of the City of Prescott Fire Department. The Chief in Prescott, Dan Fraijo, who was appointed Chief earlier this year, began his career with the Phoenix FD years ago and worked his way through the ranks up to division chief. Chief Fraijo said one member of the crew had survived because the firefighter was not with the other members when they were caught in the fire, which was caused by lightning. The 19 firefighters were found in an area that also had 19 fire shelters* deployed. Some of the firefighters were inside their shelters, used as a last resort to withstand the fire if it overtakes them-as it did. 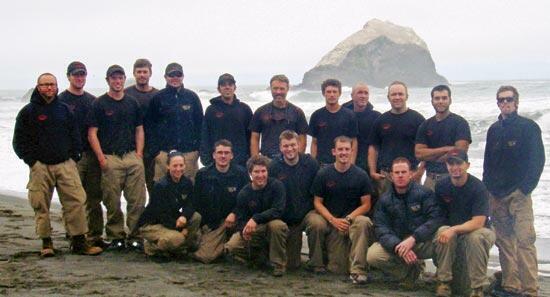 Their core values of "duty, integrity, and respect" have earned Hotshot crews an excellent reputation throughout the United States and Canada as elite teams of professional wildland firefighters.